Racist Crime in Europe: increasing, under-reported, destroying lives. Until when? 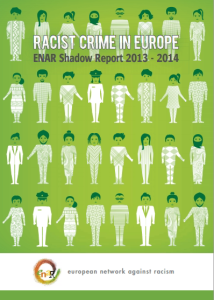 Civil society organisations across the EU report an increase in racist crimes in 2013, in particular against Black and Asian ethnic minorities, Roma, Jews and Muslims – or those perceived as such, according to the European Network Against Racism’s latest Shadow Report on racist crime in Europe, covering 26 European countries. 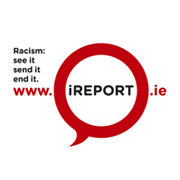 ENAR Ireland contributed to this important document by providing data from Ireland collected through the iReport.ie online racist incident reporting system. 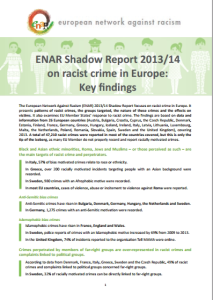 ENAR’s Shadow Report on racist crime in Europe is based on data and information from 26 European countries: Austria, Bulgaria, Croatia, Cyprus, the Czech Republic, Denmark, Estonia, Finland, France, Germany, Greece, Hungary, Iceland, Ireland, Italy, Latvia, Lithuania, Luxembourg, Malta, the Netherlands, Poland, Romania, Slovakia, Spain, Sweden and the United Kingdom.